For pressure washer repair, call PSI Equipment, your Hotsy authorized warranty and service center for the Fayetteville Springdale area. We perform on site or in-house repairs with the utmost sense of urgency. 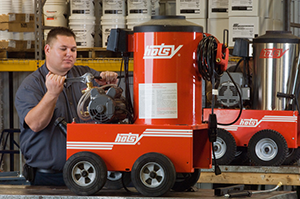 Our service techs are factory trained and can perform repair work on all pressure washer makes and models. We know you rely on your equipment, and when it’s not working, you’re losing production time and money. We have a large supply of pressure washer replacement parts in stock, meaning most times you won’t have to wait for parts to arrive. Our service trucks are on the road every weekday, and will come to your location to provide repairs as soon as possible if you can’t bring in the equipment. You may want to consider a preventative maintenance if you’re using your pressure washer often. Maintenance plans often prevent breakdowns, and help to lengthen the life of your equipment considerably. Experience the quality difference when you contact us for your service needs. Our efficiency to get the parts you need installed by qualified technicians is what sets us apart from our competitors. We make on site calls in Springdale, Fayetteville, Bentonville, Bella Vista, Springdale, Siloam Springs, Huntsville, Harrison and all points in between. Need service in a hurry? Call 479-936-8000 or complete the form below and we’ll call you right away.